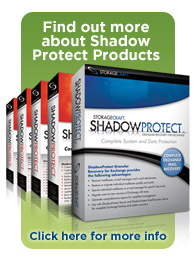 We have implemented and tested many different backup solutions over the years, but none of them give us the same level of peace of mind as StorageCraft's ShadowProtect. It takes two mouse clicks, and not many more seconds, to mount a backup image. It mounts as an additional drive so you can then simply use Windows explorer to restore the files you require. Due to its block level based approach to backups, ShadowProtect performs lightening fast incremental backups which you can schedule to run as often as every 15 minutes. No need to worry about taking tapes or poratble disks offsite each night - just use our iBackup Hosted offsite backups solution. The user interface for both versions is identical. And the Desktop version is priced so competitively that it's a no brainer for important workstations like the one that does the payroll processing or the CEO's laptop. No need to worry about maintaining selection lists - just choose the volumes you want to backup and you're set. You can install ShadowProtect on your Hyper-V hosts and it will back up all your guest virtual machines. And you only need one license for the host - regardless of how many virtual machines you have running on the host. ShadowProtect's ability to restore a server or workstation to a completely different piece of hardware borders on the unbelievable. ShadowProtect's Hardware Independent Restore capability makes it a great tool for migrating physical machines to virtual machines. Not the sort of thing the average user needs to do, but we certainly do. "VirtualBoot" and "HeadStart Restore" technologies mean you can recover from a failed server in minutes, even if it has terabytes of storage. ShadowProtect has many other features and we encourage you to contact us to learn more about them or to obtain a quote for a backup and recovery solution for your infrastructure.